Halloween may seem to have the lock on candy, but not in my world. It's Easter. Come on. Chocolate bunnies, robin's egg malt balls, super stale marshmallow Peeps, and the tooth-achingly perfect Cadbury Egg? Really, Halloween? Really? You've got nuthin' on Easter confections! So, to celebrate my love of Easter sweets, my home dec centered around the all-mighty Peep this year. I made about a billion felt Peeps to string into garlands. (A lucky few even received them tied to the real thing as gifts.) The garland came from the Dana Made It blog. See it here. 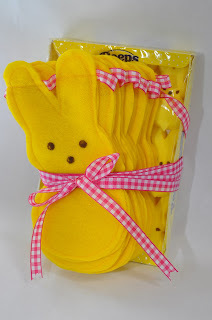 FYI: I used a 15 ft. spool of gingham ribbon per 13 felt bunny Peeps, leaving plenty of extra ribbon on the ends for hanging. I then grabbed the glue gun for a session with a styrofoam wreath and several boxes of Peeps. Here is the basic tutorial. Although, it was so simple, that a tutorial seems admittedly silly. 1. Behind the wreath, pin down one end of your ribbon. Wrap the wreath in ribbon, overlapping edges slightly to hide any signs of styrofoam. Pin the ribbon now and again with straight pins to keep the ribbon from slipping. 2. Glue your Peeps, side by side, into place. Just squish them close together, until you've completed your circle. 3. Pin a loop of ribbon to the back of the wreath and hang it proudly. 4. 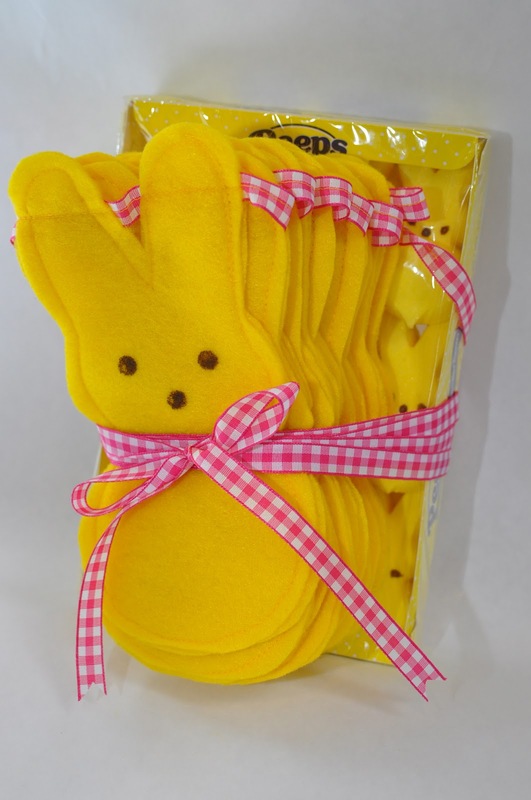 Resist the urge to eat these uber-stale Peeps when the holiday is over. Stale may be good, but that's just gross.